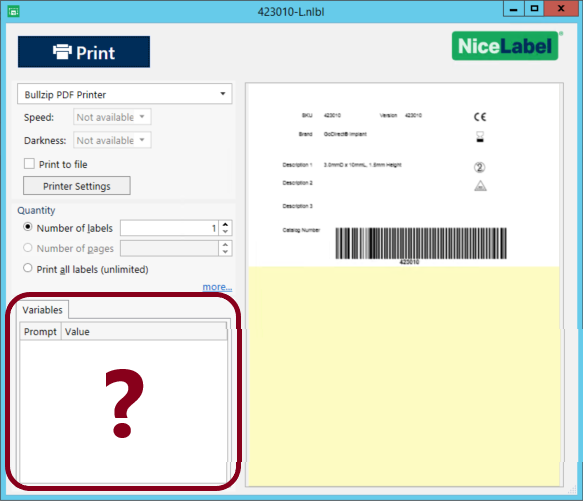 When printing a variant label in Nicelabel, some data sources are frozen (typically part number, description, etc.) but other data sources should prompt the user at print time (expiration date, lot code, etc.). This second set of labels are called ‘print time’ variable. 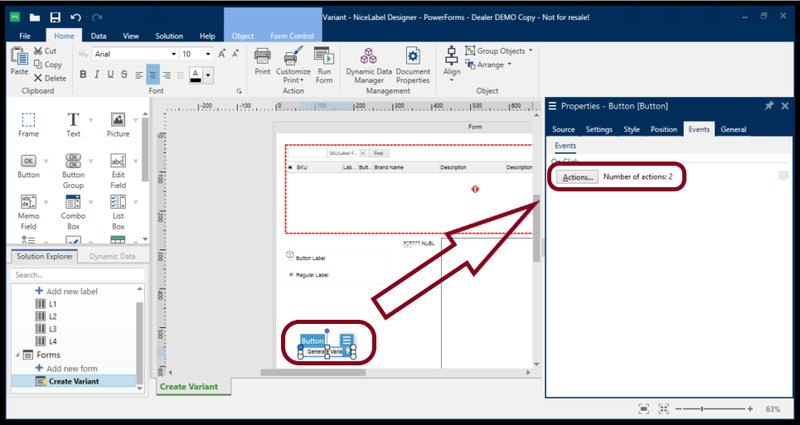 This Problem Article explores why the print time variables may not appear in the Variables section of the print screen that appears when the user is ready to print labels. When creating a variant label in Nicelabel, the form that is created transforms the label design into a variant label that freezes or locks the data sources. This is intentional so that the variant can be put through an approval process without the fear of a data source significantly changing the printed label. By default, all data sources are locked out during this process. If a data source is to remain variable after the label design is converted to a variant label, it MUST be identified as a print time variable in the settings of the form. Open the form used to convert the label design into a label variant. Locate the tool with the Create Label Variant action embedded in it. 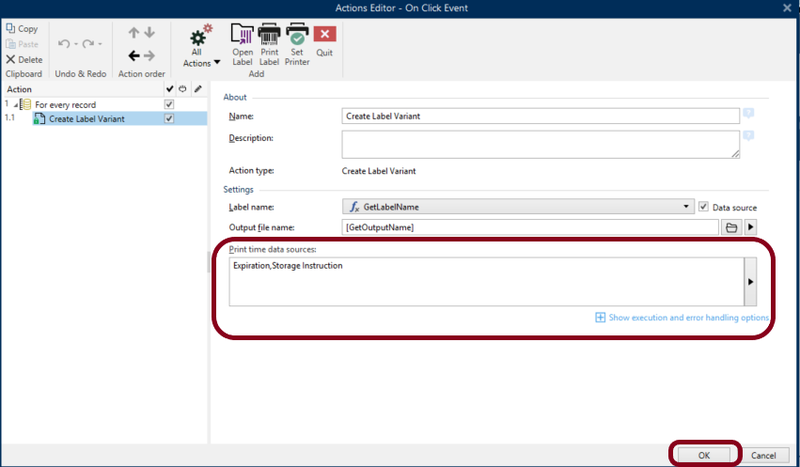 Open the properties and select the Actions… button to see the list of available actions. In the Actions editor, select Create Label Variant action. 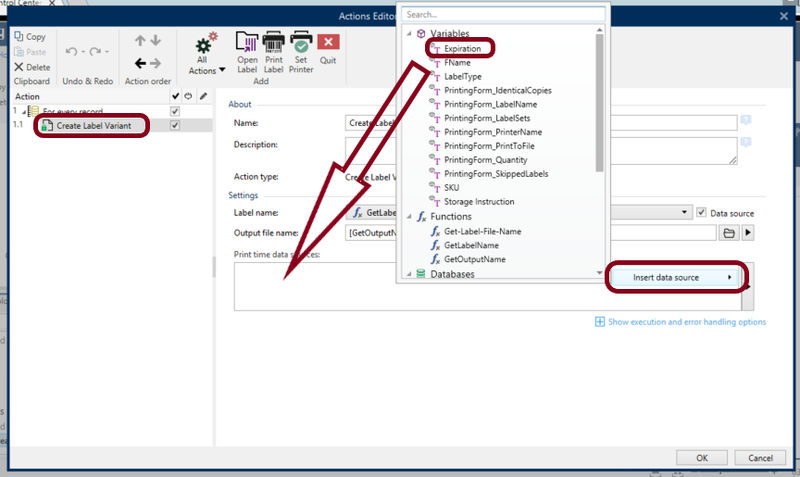 Click on the right arrow at the far right of the Print time data sources box and the Insert data source button appears. Click on that button and select the variables that need to be available at print time. 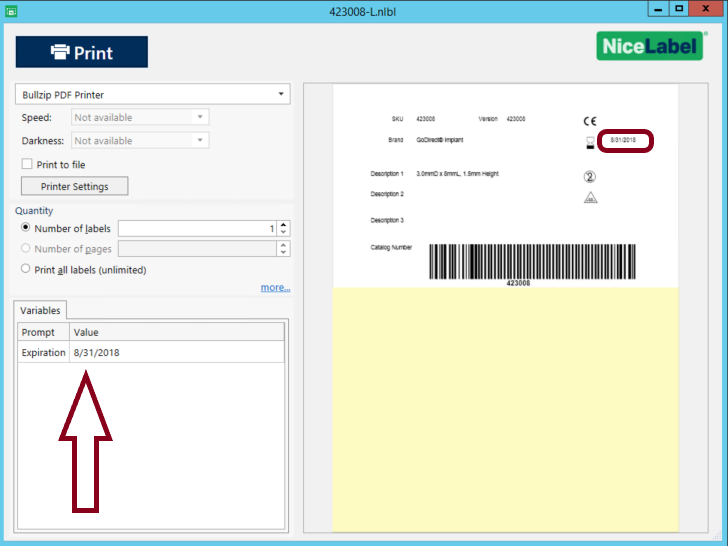 Once all desired print time variables have been identified, click on the OK button and save the form. Make sure there are no brackets around the print time variable names. After the print time variables have been identified, the variant labels must be recreated for the prompt to work at print time.